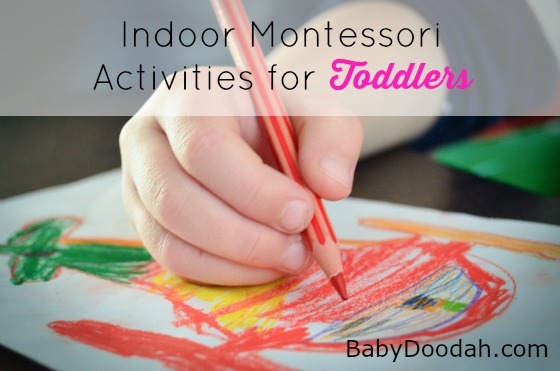 Indoor Montessori Activities for Toddlers - Baby Doodah! Puzzles are one of the most mentally stimulating indoor Montessori activities for kids. They help contribute to your child’s attention span and his thinking skills. They are the perfect way to help your child get a greater grasp on certain essential concepts through play. For example, if you are teaching your child about day and night, a celestial puzzle would be a great learning aid. If your kid is enamored by moving objects, a transport puzzle is apt for him. Ensure that you find the right puzzle for your child depending on his age and skill level. Asking your toddler to solve a highly difficult puzzle won’t be of any interest or benefit to him. Want to know the best way to help your child’s artistic inkling flourish? Just hand him a plain piece of paper, a few color pencils, and sketch pens and watch the magic unfold. While letting your child freely express his thoughts through his drawings is a wonderful idea, providing him with a creatively stimulating environment does wonders to inspire and align his thoughts! You should also encourage your little one to practice coloring and painting, no matter how messy it gets. Doing this will give him a better understanding of colors, while aiding his hand-eye coordination skills and helping him improve his focus. Matching and memory games work well to help kids develop their visual skills, concentration, spatial memory as well as the recognition of shapes and objects. What’s more is that they promise a lot of excitement and fun! You can take 2 – 3 pairs of matching cards, shuffle them and lay them face down in a row. Flip over two cards and see if they form a pair. If not, flip them back and continue till you find a pair. Once you do, keep the pair aside and continue with the other cards. Keep adding more cards as your child understands more, to make the game more challenging for your little one! Before you freak out about the idea of letting your little one creating havoc in your kitchen, consider the fact that involving him in the process of cooking can enrich him in more ways than one! The steps such as measuring, pouring, stirring, washing, rolling, etc. involved in cooking can serve as excellent learning tools for your child. These activities help demonstrate certain mathematical concepts while improving your child’s fine motor skills. You can also hand over plastic knives and cookie cutters to your kid for cutting soft foodstuffs like dough. The best part is that the more your child gets involved in cooking, the less resistance you’ll see from his end during mealtime. The art that binds people from across geographies together is also an excellent means to help augment learning and development in your child. Dance and music together provide a sensory learning environment, contribute to your child’s emotional expression, aid his memory, and enhance his motor skills and agility. Dance and music also lay the foundation for developing your child’s social skills while proving to be a fun workout too! You can try out enjoyable activities like karaoke, musical chairs and freeze dance with your kid and his little friends. These indoor activities are just as essential for your child’s emotional, mental and physical growth as are outdoor activities. Do let us know how your angel enjoyed them! What is your favorite way to get your child active while learning? Drawing and coloring are such great activities for children of all ages, and even adults looking for a bit of time to unplug! Great ideas — thanks, Aradhana!